The Liberty Flights XO Blood Tonic VG E-Liquid is a 10ml bottle of e-liquid designed to provide a sweet flavour blend of grapes, raspberries and blackcurrants with notes of herbs and spices for a unique vaping sensation. Made by Liberty Flights in the United Kingdom, the XO range of e-liquids has been developed by flavour experts to provide a complex and characterful vaping experience. Created from UK-sourced bases and pharmaceutical-grade nicotine, the XO e-juice range was inspired by the beauty which surrounds us. Some of our stock of the Blood Tonic VG E-Liquid is nearing its expiry date and, in light of this fact, we are offering the affected stock for a discounted price of £2.00. Act quickly, as this offer is only available while stocks last! 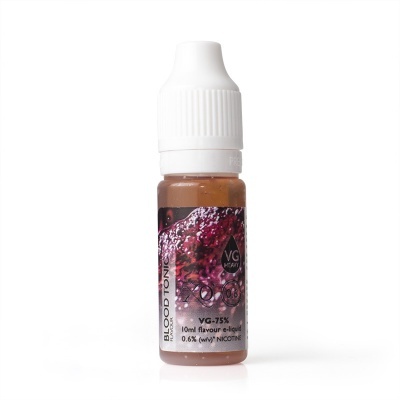 The Blood Tonic flavour has been designed to mimic the taste sensations of raspberries, grapes and blackcurrants infused with herbs and spices for a delicious and rich vaping experience. If you'd like this same great flavour with a lower VG content, the Liberty Flights XO Blood Tonic E-Liquid is also available. Liberty Flights XO Berry Nice E-Liquid - Money Off! Liberty Flights XO Strawberry Kiwi E-Liquid - Money Off!